One of the longest surviving Jewish communities still lives in Iraq. In 722 B.C.E., the northern tribes of Israel were defeated by Assyria and some Jews were taken to what is now known as Iraq. A larger community was established in 586 B.C.E., when the Babylonians conquered the southern tribes of Israel and enslaved the Jews. These Jews distinguished themselves from Sephardim, referring to themselves as Baylim (Babylonions). In later centuries, the region became more hospitable to Jews and it became the home to some of the world's most prominent scholars who produced the Babylonian Talmud between 500 and 700 C.E. During these centuries under Muslim rule, the Jewish Community had it’s ups and downs. By World War I, they accounted for one third of Baghdad’s population. In 1922, the British recieved a mandate over Iraq and began transforming it into a modern nation-state. Iraq became an independent state in 1932. Throughout this period, the authorities drew heavily on the talents of the mall well-educated Jews for their ties outside the country and proficiency in foreign languages. Iraq’s first minister of finance, Yehezkel Sasson, was a Jew. These Jewish communities played a vital role in the development of judicial and postal systems. In the 1936 Iraq Directory, the “Israelite community” is listed among the various other Iraqi communities, such as Arabs, Kirds, Turkmen, Muslims, Christians, Yazidis and Sabeans, and numbering at about 120,000. Hebrew is also listed as one of Iraq’s six languages. Yet, following the end of the British mandate, the 2,700-year-old Iraqi Jewish community suffered horrible persecution, particularly as the Zionist drive for a state intensified. In June 1941, the Mufti-inspired, pro-Nazi coup of Rashid Ali sparked rioting and a pogrom in Baghdad during the Jewish Feast of Shavuot. Armed Iraqi mobs, with the complicity of the police and the army, murdered 180 Jews and wounded almost 1,000 in what became known as the Farhud pogrom. Immediately following, the British Army re-entered Baghdad, and success of the Jewish community resumed. Jews built a broad network of medical facilities, schools and cultural activity. Nearly all of the members of the Baghdad Symphony Orchestra were Jewish. Yet this flourisng environment abruptly ended in 1947, with the partition of Palestine and the fight for Israel’s independence. Outbreaks of anti-Jewish rioting regularly occurred between 1947 and 1949. After the establishment of Israel in 1948, Zionism became a capital crime. In 1952, Iraq’s government barred Jews from emigrating and publicly hanged two Jews after falsely charging them with hurling a bomb at the Baghdad office of the U.S. Information Agency. 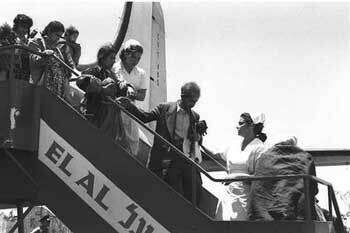 With the rise of competing Ba’ath factions in 1963, additional restrictions were placed on the remaining Iraqi Jews. The sale of property was forbidden and all Jews were forced to carry yellow identity cards. After the Six Day War, more repressive measures were imposed: Jewish property was expropriated; Jewish bank accounts were frozen; Jews were dismissed from public posts; businesses were shut; trading permits were cancelled and telephones were disconnected. Jews were placed under house arrest for long periods of time or restricted to the cities. The Iraqi government has refurbished the tombs of Ezekiel the Prophet and Ezra the Scribe, which are also considered sacred by Muslims. Jonah the Prophet’s tomb has also been renovated. Saddam Hussein also assigned guards to protect the holy places during his reign. Each year, hundreds of Muslim pilgrims flock to the holy sites to pay hommage to these prophets. Despite this life of seclusion and fear, the remaining Jews living in Baghdad simply say they are too old to leave. The Jewish Agency has sent appeals to the community, offering to relocate all of them to Israel and take care of all their absorption needs. The Kurdish Parliament passed new laws in May 2015 which established government departments dealing with seven religious minorities in their region, including the Baha'i, Zoroastrians, Yazidis, and Jews. Sherzad Omer Mamsani was named the Jewish Affairs Representative in Kurdistan in late 2015, with the job of showing hospitality to local Jews and fostering positive relations with Israel and Jewish people worldwide. Mamsani was placed in charge of all Jews of Kurdish origin, whom number close to 300,000 and mostly reside in Israel. On May 6, 2008, Abdurrahman Wahid, the former Indonesian president, received the Medal of Valor from the Simon Wiesenthal Center. Wahid is best known as the president who shifted Indonesia to democracy from 1999 to 2001, but it is his work of introducing Muslim nations to truths about the Jews that has also gained him prominence. As opposition leader, he broke ground by visiting Israel in 1994, and last year, he participated in a Holocaust conference in Bali, Indonesia, conducted jointly by the LibForAll Foundation, a group that promotes moderate Islam, and the Simon Wiesenthal Center, where he called Iranian President Mahmoud Ahmedinejad a “liar” for denying the Holocaust. After Wahid attended the Wiesenthal Center tribute dinner where he received his award, he then traveled to Israel to participate in Shimon Peres’ conference celebrating Israel’s 60th anniversary, “Facing Tomorrow.” Wahid’s message, including this active Jewish component, is to promote an ideology of moderate Islam by demonstraing that the radical factions are not pre-eminent and to promote a faith that preaches equality for women and tolerance of non-believers. The danger comes, Wahid says, when Western leaders try to accommodate Islamic extremists. Sources: Sergio DellaPergola, “World Jewish Population, 2018,” American Jewish Year Book 2018, Arnold Dashefsky and Ira M. Sheskin, Eds., (Springer Nature Switzerland, 2019), pp. 361-449. 1David Singer and Lawrence Grossman, Eds. American Jewish Year Book 2003. NY: American Jewish Committee, 2003. 2Jerusalem Post, (Dec. 13, 1997); Arieh Avneri, The Claim of Dispossession, (Tel Aviv: Hidekel Press, 1984), p. 274; Maurice Roumani, The Case of the Jews from Arab Countries: A Neglected Issue, (Tel Aviv: World Organization of Jews from Arab Countries, 1977), pp. 29-30; Norman Stillman, The Jews of Arab Lands in Modern Times, (NY: Jewish Publication Society, 1991), pp. 117-119; Howard Sachar, A History of Israel, (NY: Alfred A. Knopf, 1979), p. 399. 3Judith Miller and Laurie Mylroie, Saddam Hussein and the Crisis in the Gulf, (NY: Random House, 1990), p. 34. 4Max Sawadayee, All Waiting to be Hanged, (Tel Aviv: Levanda Press, 1974), p. 115. 5The New York Times, (February 18, 1973). 6U.S. State Department Report on Human Rights Practices for 1997. 7The Jerusalem Post (Dec. 13, 1997). 8New York Times Magazine, (February 3, 1985). 9Associated Press, (March 28, 1998). 10The Jerusalem Post (September 28, 2002). 11Stephen Farrell. “Baghdad Jews Have Become a Fearful Few.” The New York Times (June 1, 2008). 12The Washington Post, (October 3, 2006). 13Ron Kampease. “With Rock Music, Islamic Teachings, Ex-Premier Fights for Moderate Islam.” San Francisco Sentinel (May 19, 2008). 14Edy Cohen. “Iraqi Jewish archive must not be returned.” Israel Hayom (September 17, 2017).